Dog lovers of the world, we have a shop here in Hendricks County that you need to visit. Located at 120 E. Main St. in downtown Plainfield, it provides a little piece of paradise for dogs and their humans. Paw Street Bakery welcomes all dogs, who are encouraged to bring their humans, to pick out hand-made treats by the pound, gourmet treats, grain-free treats, birthday cakes, bandanas and bow ties, custom baskets and even frozen yogurt. Readers of this blog post can even get a free treat for their dog on their next visit to Paw Street Bakery! More details on that offer in a little bit. Does Spot have a birthday coming up? Order a custom birthday cake that comes with a birthday bandana and party hats for your four-legged friend and their canine friends or siblings. There&apos;s also a fun photo opportunity inside the store for the birthday pooch. 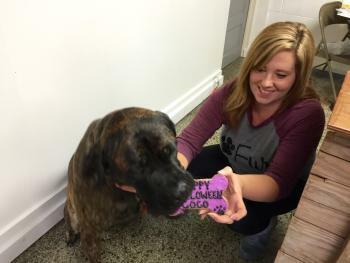 Grab a container of frozen yogurt made by The Delectable Dane, an Indianapolis-based company, and you&apos;ve got the complete canine birthday celebration setup. Has Fido been a good boy lately? Bring him into the shop and choose a custom gourmet treat. Has Rex been under the weather? Nothing says love like a "get well soon" biscuit. And do you prefer to feed Lassie snacks with ingredient labels that you can actually understand? Find her favorite flavor and purchase them by the pound at the Biscuit Bar. Shop owner Courtney Bruner makes her own dog treats at home out of all-natural, human-grade ingredients. The icing she uses for the gourmet treats and cakes is made with yogurt, peanut butter or carob. "When you look at the ingredients on the label, you will recognize every one of them," she said. "We&apos;ve all tasted the treats, too. They taste kind of bland to humans, but the dogs love them." The human taste-testers to which Courtney refers includes her small army of family and friends who have helped her with baking, icing, packaging, shipping, merchandise and even construction of the interior of the shop. Courtney&apos;s boyfriend and his father built the Biscuit Bar. Courtney&apos;s mother hand-makes the bandanas and bow ties, and her boyfriend&apos;s mother customizes them. Her friend, Nicole, helps with the baking and icing, and one of Courtney&apos;s daughters engraves glassware sold there. Courtney also utilizes her four in-house canine taste-testers on a regular basis. She and her boyfriend have a Great Dane, a Pit Bull, a Mastiff and a Weimaraner. "I just love animals," Courtney says with a shrug and a smile. She opened her store at its current location in early August, relocating from another Plainfield storefront where she had done business since October 2015. 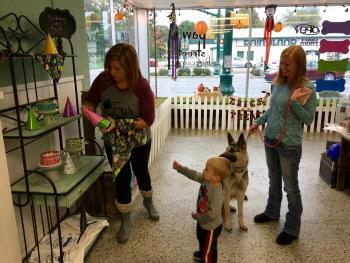 The move tripled her business, which she attributes to the busy vehicular traffic right in front of the shop on U.S. 40, as well as her proximity to Plainfield&apos;s parks and trails, where people frequently walk their dogs. Being so visible has attracted first-time customers, which turns into repeat sales and the spreading of recommendations. In addition to baking for her own shop, Courtney provides dog treats to all 12 Speck&apos;s Pet Supply locations as well as to Bentley&apos;s Pet Stuff in Indianapolis. Needless to say, she remains very busy and very appreciative of the help she receives from those she loves. Courtney loves her community, too, so Paw Street Bakery frequently orchestrates fundraisers for K-9 police officers, animal rescue groups, and other animal-related organizations. She&apos;ll also have a booth at the Plainfield Tri Kappa Gingerbread Christmas on Dec. 2 at Plainfield High School. 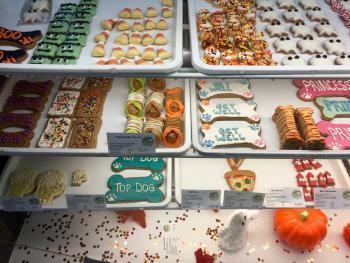 Paw Street Bakery is the only shop of its kind in Hendricks County, so make a point of bringing the pooches in and checking it out for yourself. After all, your dog is worth it, right? Mention this Visit Hendricks County blog post on your next visit to Paw Street Bakery, and get a free treat, up to $1.99 in value, for your fur baby! 120 E. Main St., Plainfield, Ind.